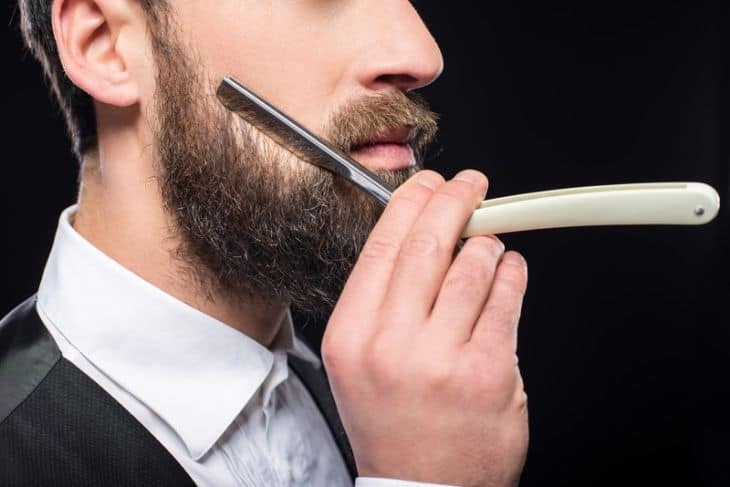 If you thought safety razors still belonged to the 19th century, you will be surprised by the fact they remain popular even today and offers the closest shave possible. Safety razors or straight razors gives you a more consistent and luxurious shave than using cartridge razors. They also save a lot of money compared to the expensive multi blade cartridges in the market. Safety razors may require practice to get that perfect shave causing no cuts or nicks. Modern cartridges due to their multi-blade design and skin protection guards lets you to shave in any direction without getting cut. But due to push and pull action of many blades, skin gets irritated and can cause ingrown hairs. With a safety razor the skin is exposed only to a single blade at a time resulting in a smooth and comfortable shave. It is also good for people with sensitive skin. A safety razor is slightly different from a cartridge type or disposable razors when it comes to shaving. The head doesn’t pivot like a cartridge razor so you to need to keep the angle close to 30 degree to the skin surface. You don’t have to apply any pressure and should use the razors weight to make short and smooth strokes. Multiple passes can give an even smoother shave. Once you have enough practice, a safety razor can give you a good shave in no time. We bring you the best-rated safety razors for beginners available today and hope our safety razor reviews will change your shaving concepts forever! The German made Merkur long Handled Razor 180 is one of the best double-edged safety razor in market. They are made of high quality steel and comes in a chromium finish which prevent rusting. A long handle give a good grip and give you the most comfortable shave. This feature is very useful for those with big hands. Merkur is mildly aggressive and has a close comb design giving you an irritation free shave. It is a three piece razor. The blade can be replaced by unscrewing the handle which opens the head. Also the razor can easily fit all type of double-edged blades available. This is one of the best DE safety razor for men and suitable for people with sensitive skin. This is another best DE safety razor for men and among the top selling safety razors. They are made in England and has a solid tubular brass body with a chromium finish. The head is classic combed head that can fit all standard double-edged blades easily. It has a tubular shiny handle with grooves which may feel short for people with large hands. It is a three piece razor and you can open the head by unscrewing the handle. Good quality chrome coating all over the razor gives it a premium finish. The kit comes with 5 derby blades as well. It is of mild to moderate aggressiveness and is suited for beginners and experts. The Edwin Jagger DE89Lbl is good buy considering the price, build quality and premium finish. The Parker 99R is a heavyweight safety razor with a Twist to Open or butterfly head with a 4 inch long handle that delivers the ultimate shaving experience. The brass body is chrome plated which can last a lifetime making it one of the best butterfly safety razors. It weighs 3.4 ounces so there is no need to apply any pressure while shaving and just let the razor do its work. It is one among best beginner safety razor and the handle has an anti-slip grip. The razor pack also comes with 5 shark double-edged blades. Vikings blade is another best butterfly safety razor made from high end materials imported from Sweden, Germany and Japan. They have an advanced butterfly head that can change blades in 5 seconds and is another best beginner safety razor and suited for professionals as well. The patented micro comb system ensure there are no nicks and cuts. The razor is made of bronze and brass alloy with chromium plating for a sleek and elegant look. Razor weight is well balanced making it comfortable to hold and shave. A travel case with mirror and 5 complimentary platinum coated blades are also included in the box. The Seki Edge feather is a luxury safety razor made in Japan by the same makers who make the worlds sharpest feather razor blades. The exquisite craftsmanship and engineering is quite evident when you hold the razor. It weighs 3.25 ounces, and the handle is 3.75 inches long which gives you a smooth and comfortable shave. The razor is a three piece model and have excellent grip. It works best with the feather blades which sits in the head perfectly. It is mildly aggressive but still produce one of the finest shaves ever. If you are looking for the ultimate luxury razor, then Seki Edge is the right one for you. There are many factors to consider before buying a safety razor. Understand the basic types of razors and features to look for while buying them. Razor Type - Safety razors are available as single piece, two piece and three piece systems. One piece razors also known as Butterfly or Twist to Open razors has a head that can open or close by twisting the handle of the razor. They are easy to operate but difficult to clean and have lesser life. Two piece razors have a cutting head with long bar that is screwed on to the handle. In three piece razors you can remove the base of head, top of cutting head and the handle. They are considered the best as there are no moving parts and can be cleaned fully. Razor Aggressiveness - This defines blade exposure and depends on factors like angle of the blade, blade gap and razor weight. Mild razors have least exposure and are best suited for beginners or those with sensitive skin. Medium razors have average blade gap to cut efficiently and are the most common type. Aggressive razors have larger blade gap and exposure allowing it to cut through beards for a close shave. It is recommended only for experienced wet shavers. Price is another factor as you can get good models at a low price and expensive premium razors to match your style. Length of the handle and weight can give you desired level of control and efficiency. Safety Bar - Razors with safety bars on the cutting head are recommended to avoid any chances of cuts compared to an open comb design that are more aggressive. Also check this cool video on how to get a good shave with a safety razor. We believe from above safety razor reviews you can pick the best safety razor for beginners to have a good wet shaving experience. Safety razors give you that manly shave which no other modern grooming devices can. Also, you need to pick a top rated safety razor blade that fits the razor, along with a traditional shaving soap to have the complete wet shaving experience. Safety razors are also used by women who don't want to use an epilator or a shaver. The Edwin Jagger Heather is a good razor designed only for women.